As you may have gathered, we have a thing for fine spirits here at DailyXY. As such, we’ve become pretty good at packing bottles when we travel, but that little task just got a whole lot easier. 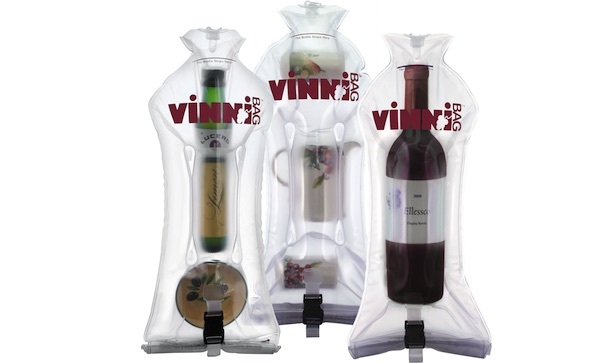 These days, we use a VinniBag ($28). It’s a protective, inflatable bag for your breakables. You stick the bottle in, partially inflate the bag, close the dry seal, and inflate the bag the rest of the way. Then you’re good to go. Your bottle of whisky probably won’t break, and if it does, it won’t soak your clothes. When you’re not using it, you can roll or fold it up. It doesn’t take up much space. We’re told that sometimes people travel with breakable things that aren’t whisky, like olive oil, ceramics, and whatnot. Well, this bag protect that stuff too. The makers say you can also put your phones and keys in the bag when you go boating for some extra protection. That sounds a bit silly to us, but we bet we’d feel sillier with our phones at the bottom of a lake.